Model B1T5 retro barstool features an upholstered swivel seat with back and double foot rings. Available in your choice of standard or designer vinyls. 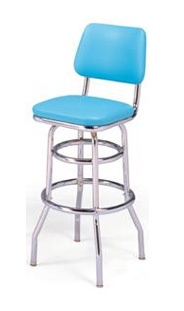 All our barstools are rated for up to 400 lbs. and carry a lifetime structural warranty. Made in the USA, and built to last!